In the mood for wok inspired, market fresh food? Order noodles, stir-fries, rice dishes and bento boxes from a Wok In A Box restaurant near you. $5 Delivery Fee. No Minimum Spend. 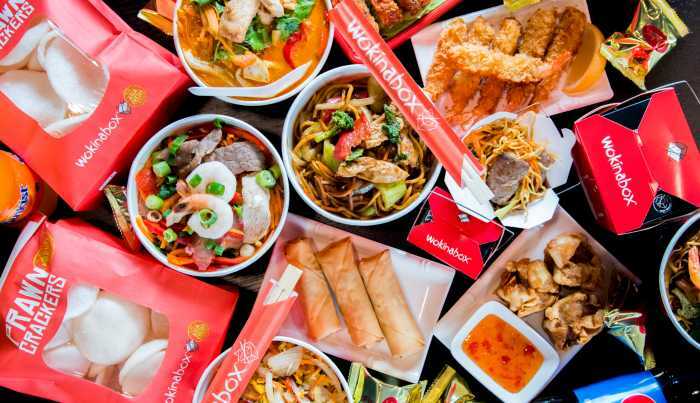 Get Wok in a Box delivered to your door! At Wok In A Box, their concept of quality, fresh and quality Asian cuisine has been a hit with hungry diners, who have slurped up noodles, stir-frys, rice dishes, bento boxes, soups from their many restaurants. Since their first Wok In A Box opened in 2002 in Adelaide, they have now opened shops across South Australia and Western Australia. With an emphasis on freshly cooked meals, Wok In A Box trained chefs make each order using real, fresh ingredients. Since humble beginnings, there are now over 30 stores and over a million food orders coming through their stores each year. Their extensive menu includes favourites such as gyoza dumplings, pad Thai, sweet and sour pork, fried rice and laksa. If you are hungry for authentic, fresh and delicious Asian cuisine, but have neither the time or energy to cook, simply place your Wok In A Box order via Menulog, and you’ll soon be filling your hunger hole with mouthwatering Asian dishes. Use your Menulog App or order on your desktop in minutes, and have your meal delivered to your door, quickly.